Home to Nordkapp and return in 2008. 16:35 All ready and off we go. Start odometer reading is 118271 miles. Just a quick call at Spring Green for camping gas, drop off a note at Katherine's and finally on our way at 17:15. Fairly straightforward run south on A1, A14, M11, M25, A2, A229, M20 arriving at the Tunnel at 21:04, odometer shows 118506 and onto the next available shuttle at 22:18. After a good sleep up for breakfast. I do enjoy their bacon and eggs. Quickly into Auchan to stock up on food, wine, beer, spirits for our trip north, then into Calais to get the latest of Ronalda's favourite Sudoku book. At Venlo we stop at the supermarket where we see a self serve fuel station, but it would not accept my Nationwide Visa card. The signs did not show Visa, but I think Mastercard may have been acceptable but we would have had to pay more on transaction and ForEx. So around to the corner and fill up at the Q8, odometer 118715 miles. All is going well until we approach Osnabruck, when it appears that the A1 Autobahn is having Sunday roadworks and is closed and everyone is kicked off onto local roads. As these are clogged with traffic, we decided to divert via Hannover, but that adds over an hour to our day, so I get a move on, taking advantage of the liberal speed limits on German Autobahns, though it does increase massively the fuel consumption. I fill up here, though notice the fuel is not cheap, then off to bed. 08:00 Typical Etap Breakfast, good choice of bread rolls, cheeses and jams, really good coffee. 09:05 off we go, into Denmark, at the border there was a lane for trucks, but for the main road the only presence was a battered old Astra with two un-uniformed people inside watching traffic passing by. Perhaps they notified the Police if a truck slipped by without going through the Customs lane. On through Jutland to the Lillebaeltsbroen (New Little Belt Bridge) and onto Funen Island, which was toll free. On across Funel Island to be surprised by a Toll Bridge at Storebaelt Bridge , where we paid 205DKK. If we had anticipated that, I think the Puttgarden to Rodby ferry, with a combined ticket for the Oresund Bridge would have been worthwhile. Then onto Kalstrop to refuel before Sweden. There was an unattended fuel station, but we could not work out how to use the machine, so went the 2Km to the Shell, which was significantly more expensive, but not worth the effort of going back to the cheaper station. Fuel here at 119287 miles. On northwards, stopping at Kanm for fuel before entering Norway. Add fuel here at 119540 miles. Ensure alcohol does not exceed their limits. Massive Duty on anything over that. Tobacco. We don't smoke - deadly stuff. On towards the Svinesund bridge, where I decide not to pay the toll and go through the old town over the old bridge. There is a long queue to get into the town, but it must be worthwhile as there are lots of people doing it. In the town we find the bridge has roadworks in hand with alternating traffic. We pass through the town and follow signs for the E6, but none of the others seem to follow us towards the motorway, then we see the motorway moving extremely slowly with both lanes full of queuing traffic. We turned round and plotted a cross country route into Sarpsborg. The hostel was easy to find at the side of the main road, a pleasant welcome and a delightful room. Downstairs in the kitchen we cooked our evening pasta meal in the kitchen. Breakfast in a pleasant dining room with candles on the tables. Our first Norwegian breakfast, with a good choice of cheeses, meats, jams and bread. Met a couple from Germany who were travelling north, but not as far as Nordkapp. They had been there before and said it was too busy there, too many people. They were going through Sweden, hoping to seen Moose (but properly called Elk in Scandinavia) as they had tried to find them in past visits and not been successful. The Moss tunnel toll was 20 NOK. On to Lillehammer, there is a long series of road works north of Olso to upgrade the E6 to dual carriageway, but traffic was flowing easily. Then we began the gradual climb to the high plateau, reaching about 3240 ft asl. Here the ground is devoid of trees and typical vegetation for the altitude. Descending off the top, Ronalda spotted a couple sat at the side of the road looking intently at something, she saw something brown, we stopped and went for a closer look. The animal turned out to be a Musk Ox, rather old and weathered, but another new wild animal to our collection. The couple we had seen were German and they told us the Musk Ox was protected, not hunted and quite rare, there being around 3000 in Norway. Moose, properly called Elk, were much more common, around 300,000 in Norwegian forests, but rarely seen because of their shyness. Off we went and another kilometre down the road Ronalda spotted another on an island in the river. This turned out to be two Musk Oxen, much younger and in much better condition. As we pass Drivstua, we see a railway station the looks almost like a model railway, just two buildings, very tidy, nothing else nearby, very pretty. Down to Trondhiem, found the hostel easy enough, however they were no longer members of the association, so would not give us discount. The room was a four person bunk beds room, we used the bottom bunks and our own linen. There was a vast kitchen for cooking our evening meal of pasta, prawns, mushrooms and courgettes. Met a young guy who was cycling for Olso to Nordkapp, then south through Finland, through Poland, Czech Republic to Istanbul in Turkey. All in 90 days. Fuelled up at XY, odometer 119965 miles. Along the E6 north, to a new tunnel approaching Korgen where we emerge to see local townsfolk planting their town's name on the banking at the side of the road. Into Korgen camping where all the cabins have names rather than the more usual number. We stay in a cabin called "London". Perhaps the staff put the English people in cabin "London", the French in cabin "Paris" and other nationalities in appropriate cabins. The on site facilities are spacious, pleasant and clean. If this is to be the standard of cabins in Norway, I will be well pleased. The cabin has a stove for cooking, so I prepare a pasta meal for supper, which we eat on the veranda. There we chat with a lady from London who was looking for fresh fish or a traditional Norwegian restaurant. We could offer no help except to go to Bergen. Fuelled up at Mo I Rana Shell station, odometer =120251 miles. We have a diversion here towards the Svartis Glacier, perhaps to look at the glacier from the lake, but the boat trip would take too long for today's available time, so we head north again. The waters coming from the glacier lake had a green milky appearance, as we headed south towards the main road we saw a crystal clear water stream flowing into the main river. I took photos of the mixing waters. Another diversion to visit Arctic Circle Raceway, a Formula 1 standard motor racing track on a hillside miles from anywhere. I can't understand why anyone would build such a track, but it does get used, so perhaps there is some logic here. It is some 10kms south of the Arctic Circle, strange not to build it just that bit further north. Just outside Fauske, we spot an Information Point at the side of the road declaring "Mid Point of the E6", at last somebody who celebrates the road. Perhaps one day there will be a souvenir shop there. Running late I think about options, we can catch a ferry from Drag at 19:00, or drive on to Boynes to catch the 20:00. So the Drag ferry wins, even though slightly more expensive. When the conductor came I told him I was "Honnor" which means "pensioner", and the passenger was charged at 19NOK instead of 39NOK. The road 872 from Boynes to Saetran was not as good as I had expected, although a new road the tunnels seemed quite narrow with difficult to see edges. This made it rather scary when a truck was going the other way. Approaching Narvik we cross the bridges at Saetran and Skjombrua, a delight to see. On to Narvik arriving around 21:10. Met by Britt, the Hostel keeper, in to our room, cooked our meal and off for a walk around Narvik. The hostel is very close to the railway line where trains bring iron ore from somewhere inland. But the sounds did not bother us. There was a poster detailing the locomotives use to haul the ore of the fence nearby. There is a cable car to the top of the nearby hill overlooking Narvik, the last car up was at 01:00 (yes well after midnight), but clouds covered the top, hence no visit today, perhaps next time. It seemed rather strange to be taking photographs at midnight, out in the open without the need for flash. 09:30 Time for a look around Narvik and some essential food shopping and some general looking around the shops. We visited the church and airport before heading northwards. The day was overcast all day with light rain most of he day. Clouds hung along the mountain sides. Fuelled up at Esso, odometer = 120540 miles. We had a quick look at the Polar Zoo, perhaps we will go in when we have more time to spare. Very annoyingly, the fuel in Setermoen was massively cheaper than Narvik, 12.36NOK as opposed to the 13.55 NOK I had paid. A side trip to Bardu Raceway proved fruitless, there was nothing accessible. The scenery today was not as spectacular as Wednesday, but still a very pleasant drive. The pine forests have been left behind and now we have birch type deciduous tress that are all quite small. Arrive at Standbu Camping, Skibotn at 18:10. Here we have a family cabin, bigger than at Korgen. Here we use the large communal kitchen to cook, though more pleasant than the cabin, the only other people there were Russian who did not speak any English, and we speak no Russian. After supper we go for a walk around the estuary, but still see no Elk even at midnight with clouds covering all the sky. Outside one of the cabins is a Nimbus motorcycle with sidecar, on Danish plates, 748cc, exposed valve gear, probably mid 50s, in very good condition. 08:45 for an early start for the long day ahead, The clouds are higher and the sun is breaking through. But ahead of us is the couple on the Nimbus who are departing as we are finishing our breakfast. Just north of Storslett, we see an incident in the road, so stop to see if help s needed. The motorcyclists we meet are from Poland and have just stopped to take photos of a caravan stood on the carriageway without any wheels. Nothing we can do so on our way. Driving along these roads, with the frequent flowing bends and traffic travelling at around 80Kph (50 mph) , overtaking possibilities are infrequent, then there is another vehicle to overtake. So we find the great effort to overtake vehicles is not worthwhile as the effective progress is not improved. One can spend all day looking at the back of a bus, better to hold back a few hundred metres and enjoy the scenery. Near Alteidet we take a side road towards Jokelfjordbreen and Oskfjordjokelbreen to see the glacier. We walk from the car park for around 2kms but the going is getting too difficult for our footwear, short of time, so we decide to take the photos here and return to the Tourneo and on our way. Perhaps next year we will walk the full 7km to the glacier or take the boat. The boat is run by he local farmer as and when required. It would be best to be part of a group to spread the cost. Further north we come to 8km of roadworks where the road is being improved, but right now it is a bit bumpy and not surfaced, it will be better next year. Fuelled up in Alta at Esso, to see us around Nordkapp. Odometer = 120873 miles. At the junction where the E69 heads towards Nordkapp we stop at the Tourist Information, buy a guide book then head north. Through the Nordkapp Tunnel where we pay a massive 192NOK = �18.96 to pass through the tunnel. 145NOk for the car and they even charge for 47NOK each passenger, this must be a throwback to when there was a ferry across the water. On to Skardsvag, where we arrive at 20:00 to be met by Solveig who explains that the room we have for tonight is a small room and tomorrow we move into the bigger room with a shower and kitchen. We cook in the kitchen in the main building, having our pasta meal there. After supper we head up to Nordkapp for the Solstice. The entry price is 200NOK each onto the site, = �39.51 for both of us, but the tickets are valid for 48 hours, so we don't need to pay again later in the day. Our most northerly point, target achieved, on time, odometer = 121016 miles. That is 2745 miles driven from home in 7days 7 hours. On the end of Nordkapp it is very cold and windy. The air temperature is 2.5 degC and wind speed of around 18 metres per second (that is around 40 mph). We find it difficult to stand up, dare not use the tripod to take photos, and the wind chill is so bad we can only be outside for a few minutes before we begin to feel uncomfortable and seek shelter. We had forgotten to take any filters for the camera, so taking photos of the sun directly was not possible. Today is to be an easy day. We have a late breakfast of breads, cheese, sliced meats and jams, with coffee and juices. Then off around the island. We go into Honningsvag, see the cruise ships arriving, walk up to the church and watch part of the "Tub Throwing" competition. It is North Cape Festival week, but we have not seen a programme or any publicity so we don't know what to look for. Then round to Gjesvaer for a picnic lunch, before heading back up to Nordkapp to have a look around the site in the quiet time, watch the presentation film. Back down to Skardsvag where we cook supper. Then after supper, I go up to Nordkapp by myself. It was amazing, around 70 coaches and the car park quite full, a few thousand people out there, but they did not seem to have a clue about why they were there. Now is the time to head south towards home. Whilst checking out of the hotel, I notice a small booklet of the North Cape Festival 2008, there have been events on, but I don't have time today to spare, so on we go. I decide that as we are setting off earlier than originally planned, we can go to Kirkenes, the end of the E6. Also we can fit in a trip to the Russian border before heading south. As we approach the tunnel to leave Mageroya, I stop to take a photo and am approached by a guy who asks if I have jump leads with me. Well of course I do, what with the Tourneo's record of flattening its battery overnight, essential equipment. So these guys are from Estonia, on holiday, just touring round and camping. After a few minutes charging their ailing Honda, it starts, they give us a few beers and off we go through the tunnel. We have to pay another massive 192NOK = �18.96 to pass through the tunnel. Why on earth they charge twice seems odd as there is no other way off the island. Just out of the tunnel on a narrow section of road, we clash door mirrors with a camper van going the other way very fast. He does not stop. Our left hand mirror is a complete write off, I pick up the pieces but there is no chance of a bodgy repair, even the hinge is damaged. We fuelled up at Esso Lakselv, odometer = 121232 miles. Neiden Kapelle, was well worth the stop, a really beautiful church. It was locked so we could not go inside, there are opening times on the board outside, but we must press on. I buy a caravan extension mirror and lash that to the damaged arm. It will do as a temporary fix until we get home. The price on the till receipt is greater than that on the box, so I go in to complain and the girl gives me 46 NOK cash from the till. On to Kirkenes, a rather boring small industrial and fishing town, but we go to the end of the E6, then round to the Russian border, then find somewhere to stay for the night. At Kirkenes Camping, some 5 miles south of the town, I phone the number on reception to be told the cabin keys are in a box nearby, to take cabin 18 and pay in the morning at 10am. We stay here. As we have time to spare before 10am, not a massive target for today, we go into Kirkenes, do some food shopping, have a quick look round, then follow the railway line to see where it goes. This must be the most northerly railway in Europe, so where are the trains? It looks unused, industrial, perhaps for iron ore. But in good condition as though it has only just gone out of use. A little research reveals that there was a large iron ore mine nearby, and a new company is attempting to use the large holes in the ground as a massive landfill rubbish dump. We used up our only Norwegian currency on fuel, odometer = 121462 miles. Then across the border into Finland, where there are the signs of a lower tax regime. There were shops, fuel etc in the middle of nowhere except near the border. The road is smooth surfaced, quite wide with wide soft borders, trees line the road about 4 metres away. There are pretty lakes at the roadside and through the trees. For a little while it is all pretty, then it gets boring then very tedious. We get to Tankavaraara around 16:30, quickly check in and set off to see the Gold Museum. There we find that we should have put out clocks forward one hour and it is really 17:40 and too late to see the museum effectively. Perhaps another day. We have been given a small cabin, but it is really quite big with a double bed downstairs and an upstairs room with one double bed and two single beds. We use the double upstairs. There are mosquitoes around and we need to be careful not to let any into the cabin. Before supper we decide to do one of the walks in the nearby forest, the Geology Walk of 7km. After about 15 minutes we discuss going back to get some insect repellent, but decide to press on. The mosquitoes are a nuisance and spoil the walk. There are streams to cross, where some fitness was needed. Perhaps they install bridges and walkways for the tourist season, but that is only a few days away now. We have a pasta supper, using the cooker in the cabin, but not daring to eat outside because of the mosquitoes. Quite boring these roads, but making good progress. Fuelled up in Sodankyla at ABC. Odometer = 121713 miles. .Here we decided to feed the machine with brand new Euro notes, it took our 80 Euros and promptly delivered our fuel. Just north of Rovaniemi, we came to the Finnish "Arctic Circle Centre", with much to do with Christmas and Santa Claus. This is a very commercial place where all the letters to Santa come, and are answered by his little helpers. Here we wrote some Christmas cards and posted them. Someone is in for a surprise to get a card so early. Fuelled up in Tornio supermarket. Odometer = 121888 miles. On south to Lulea, to Tina's Rum. We were later than she normally is around, so I telephone and she gave me the access code and left the room key out for us. As we were settling in, Tina appeared, and we chatted about life and being relaxed about life. Off from Tina's Rum at 9:45 after a delicious Swedish breakfast, breads, cheeses, meats and fruit. A long day ahead, and I spotted occasional vintage trucks heading north, Volvos and Scanias. It just seemed odd that these things were still in use these days. We had seen plenty of old trucks around, but some of these were quite smart. At Umea, I spotted a Ford dealer, who when I called in was very helpful with trying to sort out my broken mirror. But it seems all the left hand drive units are different part numbers to right hand drive, so there must be some important differences. I think I will wait until I get home. Nearby is a large Scania workshop where I spot several old trucks. It seems there is a Midnight Sun classic vehicle rally in Lulea this coming weekend, and many of these Scanias have been prepared by the factory in Stockholm to go there. We stop at H�gakustenbron, in 1997 this was the longest suspension bridge in the world. On to Sundsvall, Ibis hotel, clean, clinical, city centre hotel. Off from Ibis at 09:15 after their typical massive selection for breakfast. Their boiled egg was really good, suited me perfectly, perhaps I just happened upon the right egg at the right time. Fuelled up just south of the town at an unattended station that seemed to be cheap, but when I actually started to fill I noticed I was paying more than I had seen across the other side of the road. I decided to keep going, but it cut off around 390 Kroner. That was enough to get us to Stockholm, so as it was expensive, we accept its judgement and get on our way. Odometer = 121888 miles. Stockholm, we will come back here again, lively city, hot at 25degC, lots of activity. But we are headed for the Vasa Museum to see how it has changed since Ronalda was here 40 years ago. We are really amazed by this boat, the workmanship that has survived and the way it is presented. I was really pleased. Fuelled up at a Shell Express just out of Stockholm at Skarholmen. This looked like cheap fuel, so here we go to fill up, but it knocked off at 400 SEKs, so perhaps these stations only allow limited delivery, so try again, and get another 400 SEKs, then another go to finally fill the tank. Odometer = 122550 miles. We phone Wyn to tell him where we are then off down the road to exit 135 to meet Wyn. Besides being older, he hasn't changed much, then onto Lid and his house. He has a magnificent house here, an old chapel converted to a house, lots of space, big rooms and space to breathe. Great countryside. We had a great relaxing evening, chatting about times past and colleagues of the past. Off from Wyn's at 11:45, we don't have a massive distance to go today, and the bed is a easy Ibis. Irena recommends we stop for lunch at Granna which is famous for its special sweets. We stopped and saw what we know as "seaside rock" being made. Further south to Helsingor, the southern end of the E6 is at Scanlines terminal. Now we have been travelling the E6 End to End ( well except for a few bits where we took a slightly different route). 09:45 off and a quick look round Malmo. 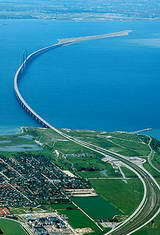 Then off over the Oresund Bridge and tunnel into Copenhagen. We park up near the mermaid and walk down to the harbour front to see the mermaid then walk around the Fort seeing the Hussar's horses, meeting a soldier about to be married in the Fort's church. Then for a quick look around Copenhagen, we hear bells and see a copper dome and stop to see what it is. The church has a sign that it is open for people to climb to the top of the dome at 15:00. We can fit that in so we have time for a quick walk round he harbour front, then up we go. Great views and yet another tower climbed. On through Denmark once again using the Toll Bridge at Storebaelt Bridge , where we paid 205DKK. Back to ETAP, a known hotel. This is a long day's travelling ahead, so up early and off we go at 08:45. I decided to have a look at Bremen, as we are well up on schedule, we spot a car boot sale and stop for a look around. Late in the afternoon, in Belgium south of Ghent, we become aware that the motorway travelling the other way is stationary and there is a long queue, then it clears, then another holdup, then it clears, then I spot a helicopter blade poking out from between trees at out side of the road, then another blockage with many blue light vehicles on the opposite carriageway. It seems there have been many incidents heading towards Germany, perhaps people rushing to see their team in the football European Cup . Here we are on the last day, heading back to England. First to check where we are with the GPS, load up, fuel up, shop at Auchan then off home. Driving towards the Euro Tunnel there is something loose on the outside of the Tourneo, but I can't see any problem inside or underneath. We are driving towards the tunnel entrance when something falls off, I see something black bounce in the road behind, but it is not practical to stop because of the poor hard shoulder and no way to turn round to go round the route again. I wonder what it was, when we had stopped I checked underneath but couldn't see anything adrift. We catch the tunnel, it is easy, soon into Folkstone and on the way round the M20/ A229 / A2/ M2. Dartford tunnel is a big slow down, too much traffic for the toll booths, there needs to be a faster way of getting paying vehicles through. Once free an easy trip up the M11 / A14. Then I remember what I have done. I had put the Garmin GPS on the roof in Calais to fix the position, got distracted by someone talking about heading to Dijon and I had driven off with it on the roof. That is what had fallen off approaching the tunnel. A sad loss. I am very annoyed.